We learned months ago, and it was recently confirmed, that when Donald Trump brags about knowing establishment politicians, and that they “love” him, he isn’t kidding. Trump’s net worth being whatever it is, he has spread a good deal of it all across the political landscape, to the extent that he can pick up the phone and access some of the highest political leaders in the country, instantly, and pester them about whatever happens to be on his mind — trade with China, illegal immigration, a wall across the southern border, you name it. And they are obliged, at least in their own minds, to listen. Trump has therefore gained unfettered access to lawmakers and decision makers that would be impossible for ordinary constituents (troubling, given his promotion of eminent domain for his own commercial projects). 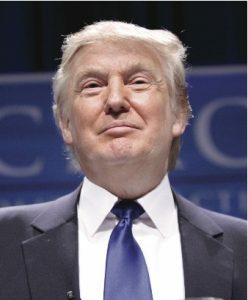 We became aware of one such exchange, here in southwest Montana, where the Donald repeatedly dogged one of our highest ranking national leaders, and that official dropped what he was doing (to his knees, Trump might say) and dealt with the billionaire’s recommendation on national policy (which, it should be noted, was rejected). Why so vague a description of this Trump-establishment connection—no names, dates, or specific locations? The reason is this—we are withholding information conveyed to us casually and not intended for publication but that originated close to one of the parties involved, the other party involved being Donald Trump, as he reached out to the establishment VIP vacationing here, in Montana, where members of the Trump family have also vacationed. In short, our source didn’t intend for the particulars to be published, and though we are in possession of the full set of details, we must respect our source’s wishes, and that requires holding back certain names and details. The implications though of Trump’s high level connections and influence are newsworthy. What if, hypothetically, a guy like Trump could have at a moment’s notice picked up a phone and initiated a conversation with Nancy Pelosi, Harry Reid or Speaker Paul Ryan—while Ryan was hunting, say, in Wisconsin or Montana. And what if Paul Ryan (or whoever) felt obligated not only to give the time of day, but part of his vacation, to Trump as he humored the Donald, indulging his stream-of-consciousness, his ramblings, and as the Donald tried to inject positions into a Party platform, legislation, or talking points. Basically, that is what happened. Not saying it was Paul Ryan, but that’s the nature of the event that took place here, and Trump, let’s be clear, was unsuccessful in his attempt to steer Party politics, in this case toward his views on the “anchor baby” issue. The particular incidents in question, in our backyard (where people like Barack Obama, Rahm Emanuel, John Boehner, Donald Rumsfeld, White House advisors and a slew of others vacation) was of a particular nature that revealed the degree to which high elected officials or party bigwigs feel obligated to confer with wealthy donors. In this case, Trump pestered the high official, this establishment figure. He called many times over a period of days, and each time his call was readily taken, though Trump’s controversial policy proposal made the call recipient visibly uncomfortable. The details, if revealed, would strike anyone as ironic and funny, the notion of some establishment bigshot in camo gear on a hunting trip (again, hypothetically), trying to get away from it all, when, with that six point buck in his sites, the phone rings, and who’s on the other end — it’s Donald Trump. Not once on a single day, but repeatedly. Similarly, the National Archives just released documentation of Trump’s repeated access to the Clinton White House, including then first lady Hillary Clinton. Trump, on the other hand, touts his largely self-funded campaign, that he is not beholden to donors in the way that his rivals are. And so he is saying, in effect, that if elected President he would not feel the need to take calls from wealthy contributors and do their bidding. Donald Trump tends to repeat himself, you may have noticed. On this one score at least, we found evidence that Trump’s claim is fact based, that while politicians don’t necessarily do his bidding, they drop what they are doing and take his calls (lots of them). And, yes, they do love him—to the extent that money buys love.